Overrun discount. Get them while they last! Click here to add to your cart. 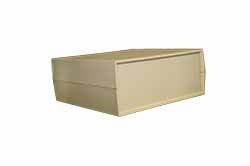 150X5 Beige Enclosure On Sale! This is a discontinued color that we are letting go at 80% off. These cases were from a special run we did for a customer and the remaining ones are being offered at a reduce price. We have about 280 of these in stock. Click here to see about this case. This is a special color that was ran for a customer. We have 125 of these left. End panels are black.Click here to find out more.